I’ve been poking around the internet and books for some cool experiments and information about eggs in general. I came across this really nice breakdown of the various parts of a chicken egg over at edinformatics.com and have duplicated the information below. I’ve always wondered what those white stringy things (Chalaza) are in my eggs when I make an omelet and now I know not only their name, but also what their function is inside the eggs! Eggshell – The outer eggshell is made almost entirely of calcium carbonate (CaCO3) and is covered with as many as 17,000 tiny pores. It is a semipermeable membrane, which allows air and moisture to pass through its pores. The shell also has a thin outermost coating called the bloom or cuticle that helps keep out bacteria and dust (see below 15). Inner shell membrane – These two membranes – outer and inner – are just inside the shell surrounding the albumen (white). The two membranes provide an efficient defense against bacterial invasion and are made partly of keratin. The outer membrane sticks to the egg shell while the inner membrane sticks to the albumen. When an egg is first laid, it is warm. As it cools, the contents contract and the inner shell membrane separates from the outer shell membrane to form the air cell (see 14 below). Chalaza – are twisted in opposite directions and serve to keep the yolk centered. The more prominent the chalazae, the fresher the egg. Exterior albumen (outer thin albumen) — The outer thin albumen is a narrow fluid layer next to the shell membrane. Middle albumen (inner thick albumen) -The inner thick white (chalaziferous layer) is a dense, matted, fibrous capsule of albumen around the vitelline membrane of the yolk. The matted fibrous capsule terminates on each end in the chalazae, which are twisted in opposite directions and serve to keep the yolk centered. This part of the egg is a excellent source of riboflavin and protein. In high-quality eggs, the inner thick albumen stands higher and spreads less than thin white. In low-quality eggs, it appears thin white. Vitelline membrane – The clear casing that encloses the egg yolk. When an egg is said to be “mottled”, the yolk surface is covered with many pale spots or blotches. The strength and integrity of the vitelline membrane are very important in preventing egg yolk mottling. Nucleus of pander – a plug of whitish yolk, with no particular significance for development and whose function is purely a nutritive one, like the rest of the yolk. (See: Int. Schmitt S., (2005) J. Dev. Biol. 49: 1-8). Germinal disk (blastoderm) – a small, circular, white spot (2-3 mm across) on the surface of the yolk; it is where the sperm enters the egg. 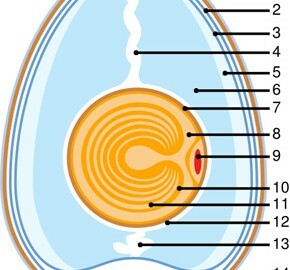 The nucleus of the egg is in the blastodisc. The embryo develops from this disk, and gradually sends blood vessels into the yolk to use it for nutrition as the embryo develops. Yellow yolk – a major source of vitamins, minerals, almost half of the protein, and all of the fat and cholesterol. The yolk contains less water and more protein than the white, some fat, and most of the vitamins and minerals of the egg. These include iron, vitamin A, vitamin D, phosphorus, calcium, thiamine, and riboflavin. The yolk is also a source of lecithin, an effective emulsifier. Yolk color ranges from just a hint of yellow to a magnificent deep orange, according to the feed and breed of the hen. White yolk – Also known as, the latebra is an area of white yolk located in the center of the yolk. It is lower in fat and therefore stands out as a bright white area in many Magnetic Resonance Images. 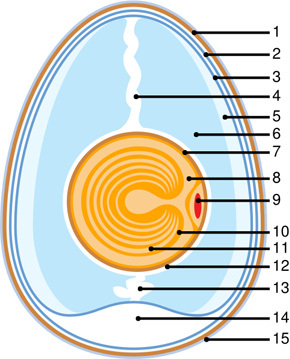 The specific function of the latebra is uncertain but it may act as a central structure around which the additional layers of the yolk are formed. Internal albumen (Chalaziferous albumen)– The inner thick white (chalaziferous layer) is a dense, matted, fibrous capsule of albumen around the vitelline membrane of the yolk. The matted fibrous capsule terminates on each end in the chalazae, which are twisted in opposite directions and serve to keep the yolk centered. Chalaza chalazae, which are twisted in opposite directions and serve to keep the yolk centered. The more prominent the chalazae, the fresher the egg. chalazae, which are twisted in opposite directions and serve to keep the yolk centered. Air cell – An air space forms when the contents of the egg cool and contract after the egg is laid. The air cell usually rests between the outer and inner membranes at the eggs larger end. As the egg ages, moisture and carbon dioxide leave through the pores of the shell, air enters to replace them and the air cell becomes larger. Cuticle or bloom – The shell is produced by the shell gland (uterus) of the oviduct, and has an outer coating, the bloom or cuticle. The cuticle somewhat seals the pores and is useful in reducing moisture losses and in preventing bacterial penetration of the egg shell. Most of cuticle is removed from table eggs when they are mechanically washed.